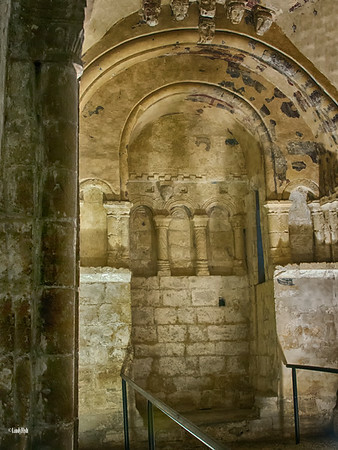 The Chapel, named after Cormac Mac Cárthaigh, the king of South Munster who commissioned it, is one of the earliest and best-preserved examples of early Irish Romanesque architecture. Consecrated in 1134, the exterior and chancel of the Chapel are decorated with round arches and chevron designs, and its steeply pitched roof is typical of the 12th Century Irish style. The sandstone Chapel is heavily decorated with carvings and its choir was, originally, covered from floor to ceiling with costly frescoes. Fragments of these can still be seen today. The arch leading to the choir was also decorated with a series of mysterious carved heads. The Chapel, named after Cormac Mac Cárthaigh, the king of South Munster who commissioned it, is one of the earliest and best-preserved examples of early Irish Romanesque architecture. Consecrated in 1134, the exterior and chancel of the Chapel are decorated with round arches and chevron designs, and its steeply pitched roof is typical of the 12th Century Irish style. The sandstone Chapel is heavily decorated with carvings and its choir was, originally, covered from floor to ceiling with costly frescoes. Fragments of these can still be seen today. The arch leading to the choir was also decorated with a series of mysterious carved heads.